Egg production from our flock increases with daylight, decreases as there are fewer hours of sunshine. We work to counteract this with strategic purchases of chicks. Our anniversary flock, the Silver Lace Wyandotte and the Arucanas, will begin egg production in November. It would be better now, but the peeps were not available until late June. 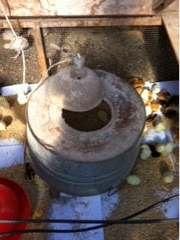 Yesterday we received a new shipment of baby hens. Day old, in a couple boxes shipped via the postal service. 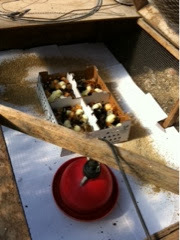 Paper goes over their brooder floor until they learn to eat feed and not bedding. Homer built a homemade hover. A washtub, a few chunks of wood for legs a clip on light and a warm bulb. A hole cut in the bottom of the washtub. Creates an environment where the peepers can adjust to temperatures on their own. 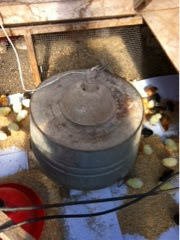 In the brooder when warm enough, sheltered when warmth is needed.